They finally finished packing and set off on their way to Bethlehem. But this wasn’t a pleasure trip. It was a trip made solely because the Roman emperor had ordered it. Everyone had to be registered in a census, but this wasn’t a census to figure out how to distribute members of Congress or how to allocate social welfare programs. This census had only one purpose – to identify every person under the power of the Roman Empire, so they could all be taxed. Yes, name right there, address just below. Sign here, please. Thank you, here’s your taxpayer ID number; one of our agents will be contacting you shortly. They barely had enough to survive on as it was, before the tax, and the cost of this trip was going to make things even worse. Why did they have to go to Bethlehem to register, anyway? Rome couldn’t have cared less what tribe or clan you were from, much less where its ancestral home was; all they cared about was that the check cleared. The tax was going to be collected in Nazareth anyway, why couldn’t they just register there? No, this trip was just another way for Rome to inconvenience the locals just because they could; just to remind them who was in power; who was calling the shots. So like it or not, and with the added inconvenience of traveling while extremely pregnant, off they went. At very least, they’d be able to mix a little pleasure with the business. At the risk of contradicting countless Christmas pageants and TV specials, there wasn’t any such thing as a commercial inn or hotel in ancient Palestine. When you traveled, you had to stay with relatives, or rely on the hospitality of strangers. That’s why the idea of extending hospitality was so important in the ancient world; it was a life and death matter. It was so important, the prophet Ezekiel tells us that it was a lack of extending hospitality and compassion to others that caused God to destroy Sodom and Gomorrah. So when they got into town, Joseph and Mary checked in with some of Joseph’s relatives, but with all the people pouring into the little village for the census, all the relatives’ homes were already full with other houseguests. The homes in Bethlehem were all very similar – the family’s sleeping quarters, what in the ancient Greek was called the kataluma, were all on an upper floor, while the ground floor was cooking space, and work space, and where the animals were kept. So since all the guestrooms were already full, one family member gladly welcomed them into his home. Sure, the bedrooms are all full, but we’ll put some sheets on the couch, blow up the air mattress, and you can sleep here on the first floor. It isn’t much, but it’s warm and safe and dry, and we’ll all have a good time visiting together; come on in. Of course, while they were there, Mary goes into labor and has her baby. And just like so many people who have used a dresser drawer as a makeshift bassinette in a pinch, Mary improvises for her newborn baby, wrapping him up snugly and laying him in a niche cut into in the wall that was normally used as a food trough for the animals. And as soon as they can, all of Joseph’s family members staying in this house and probably several others nearby, all of the baby Jesus’ new aunts, uncles, and cousins, crowded the ground floor of the little house to get a peek at their new little relative, to touch him, hold him, count his fingers and toes, kiss him on the forehead. Not far outside of town, some shepherds had finished their work for the day and were trying to get a little bite to eat just before they tried to find a soft spot on the ground to sleep on. Shepherds were typically, the weakest, the slowest. The family members who couldn’t really do much of anything else, so they were sent out into the field to watch the sheep; it was hard to mess that up. They were at the lowest rung of society. Plus, they just smelled bad. And yet, it was to these shepherds that God chooses to be the first to hear about Jesus’ birth. The angels tell the shepherds about the wonderful news of this magical night, and the birth of this child, God’s chosen one, who would change the world forever. So they head into town and somehow, they find the right home, and they knock on the door. The owner welcomes them in and offers these strangers the hospitality of his home. He shows them where they can clean up a bit; his wife offers them some bread and a little wine and maybe some dates. After they’ve eaten, they work their way through all the relatives and introduce themselves to Joseph and Mary, and ask if they can see this wonderful child they’ve been told about. And one of Jesus’ little relatives, wanting to act oh-so-grown-up, carefully picks up her little baby cousin and shows him off to the visitors. And like everyone else, they look at the little baby in all his newborn perfection and can only imagine the hope and possibility of this tiny new life. If they only knew. Well that isn’t exactly the traditional way to tell the Christmas story. But it certainly isn’t anything contrary to the scriptures, and it’s probably a lot closer to the way the events actually would have unfolded. Thinking about the Christmas story this way helps us to remember some important things, things that can easily be missed if we just hear this story yet again and imagine it in the same way that we’ve all gotten so familiar with. Jesus’ birth occurred in the midst of the powerful rule and oppression of an occupying civil government. Emperor Augustus was officially known as the Son of God, the one with all the power. This story says no, *here* is the Son of God, here’s where the real power and real goodness is. Real peace is God’s peace, not the heavy-handed peace imposed by Rome which caused so much trouble in the people’s lives. This story reminds us that we need to place our trust in God, not in the powers of the world who would try to take God’s place in our lives. This way of thinking of Jesus’ birth also emphasizes that from the moment of his birth, love, and compassion, and hospitality are important elements being held up in this story, if we can pay attention to it, that set the stage for how important these issues will become in Jesus’ teaching as an adult, and how important these things are to us as his followers. And it’s important to notice that the very first people who God comes into contact with, in this direct way, are the common people – Joseph’s family, and their neighbors, and the lowly, smelly shepherds just in from the fields. This is who God first reaches out to, to share the good news of God’s favor for them. Not to the Emperor Augustus in Rome. Not to Herod the Great, the emperor’s appointed king of the Jews. Not to the chief priest at the Temple in Jerusalem. Not to the rich or powerful. Frankly, not even to people like us. To the poorest of the poor; the lowest of the low. God’s good news is good to them first, and then to us. If you’re here tonight, you know that this time of year, so filled with happiness and joy for so many people, isn’t so joyful to everyone. The odds are that you’ve suffered some loss, maybe this past year, maybe longer ago, that you’re still wrestling with. Maybe your loss occurred at this time of year, and its anniversary has brought it to the forefront of your mind again; or maybe the memory of that loss, or separation, or disconnect, or just plain loneliness, is just brought more sharply into focus during this time of family and friends and togetherness. For whatever reason, whatever the details, there’s an aching in your heart, something that just doesn’t correspond with the overriding emotion of the Christmas season. The Book of Proverbs warns us not to sing songs to a heavy heart, but in fact that’s exactly what you feel every time you turn on the television or radio, or see friends gathering together and laughing and having a good time, apparently without a care in the world. It can make us feel disjointed. If we aren’t acting happy like everyone else, we gradually get pushed to the side of all the festivities. We can start to feel like we and our pain don’t matter; not to the people around us, not even to God. We aren’t alone in this. A lot of the Psalms are songs of lament – outpourings of pain, sorrow, anger, even accusation against God. After laying out the pain in the psalmist’s heart, some of them turn around toward the end, conceding that God is really good and in control, and the psalmist is confident that everything is going to be alright. But some of them don’t do that. There isn’t any neat, tidy resolution to the problem like a TV sitcom where everything’s resolved by the end of the episode. There’s no acknowledgement of God’s goodness or compassion. There’s only the anger, the sadness, a sadness that’s hung in the air and in our ears for some 2,500 years. I think it’s important that these Psalms are a part of our tradition. They show us a number of things, but tonight, they’re especially important because they show us that in our faith, we take pain and sorrow seriously. We don’t sweep it under the rug and try to act like it doesn’t exist. We don’t try to prescribe some quick-fix for it. All of those psalms of lament, and the other places throughout the scriptures that paint pictures for us of the sorrow and suffering of people, show us that we are not alone in our sadness. We’re in the company of all of these people from the past – and we’re in the company of each other here tonight as well. This evening, as we look around, we can see that we’re not alone in our feelings; there are many of us here who are experiencing the same thing And it isn’t unnatural, it’s perfectly normal, and we don’t have to apologize, or feel guilt or shame over the way we feel. Instead, we can honestly recognize and acknowledge our feelings, and we can honestly share them with God. This evening, we can look around us, and see faces of good friends who can offer us understanding and comfort for our feelings, because they know those feelings themselves. And as we look around, and we see those faces, we see people who we can offer that same kind of comfort and support too in return. People coming together on this night, the night of the year that has the least amount of daylight and the most amount of darkness, looking forward to the coming of greater and greater light, is something that predates the Christian faith by thousands of years. 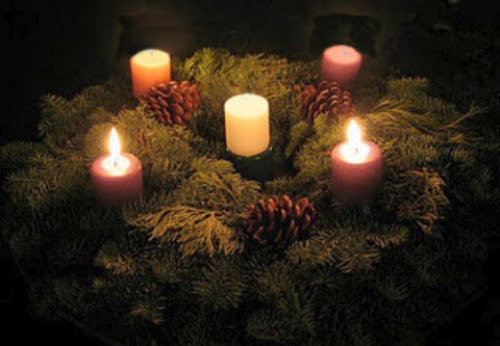 As Christians, we’ve borrowed the same idea, through our observance of Advent, as we gradually light more and more candles, symbolically increasing the light until the arrival of Christmas – the birth of Jesus, and the entrance of the ultimate, true light into the world. And we continue to observe this service, as we ask that the light of Christ, the light of God, would increasingly break into our existence, and into our own heavy hearts. As hard as it might be to believe while we’re in the midst of our grief, that really is possible. We can see that possibility when we think about God’s light breaking into the world through Jesus, in the weakest, humblest way possible – a man who knew near-constant sorrow and setback. He didn’t know any of the benefits of wealth or power or prestige, but all of the pain of rejection from family and friend alike. A man who seemingly never had any real security or stability in his life, and who eventually paid the ultimate price while being persecuted by his enemies. So even while we suffer, and mourn, we can know that God, through Jesus, knows and understands our loss and suffering. Jesus walked this same path. And he walks it together, with us, now. Christmas is the time that we observe God’s light breaking into the world, to shine into its darkest places. In a little while, we’ll invite you to come forward to light a candle to remember and acknowledge your loss, your sadness, whatever it is. And when you do, imagine that you’re coming into the very presence of Christ, presenting your sadness to him, and asking him to heal you of its pain and to remove that burden from your shoulders. And after you’ve lit your candle, take it, and the candle holder, home with you. Put it somewhere in your home that you’ll see it often. And whenever you wrestle with your sorrow this coming year, light your candle again, as a reminder that Christ, the light of the world, is with you always – especially in the midst of your suffering. Christmas is a time of joy, certainly. But a big part of that joy is that God has come into the world to set the captives free – especially those who, like us, are held captive by the pain in our own hearts. Amen. There was a man sent from God, whose name was John. He came as a witness to testify to the light, so that all might believe through him. He himself was not the light, but he came to testify to the light…. This is the testimony given by John when the Jews sent priests and Levites from Jerusalem to ask him, “Who are you?” He confessed and did not deny it, but confessed, “I am not the Messiah.” And they asked him, “What then? Are you Elijah?” He said, “I am not.” “Are you the prophet?” He answered, “No.” Then they said to him, “Who are you? Let us have an answer for those who sent us. What do you say about yourself?” He said, “I am the voice of one crying out in the wilderness, ‘Make straight the way of the Lord,’” as the prophet Isaiah said. Now they had been sent from the Pharisees. They asked him, “Why then are you baptizing if you are neither the Messiah, nor Elijah, nor the prophet?” John answered them, “I baptize with water. Among you stands one whom you do not know, the one who is coming after me; I am not worthy to untie the thong of his sandal.” This took place in Bethany across the Jordan where John was baptizing. I don’t like John the Baptist. You know the relative I’m talking about. Well that’s the way I picture John the Baptist. A little too intense for his own good, not helping his own arguments just because he’s always just a little too confrontational, too insulting, too in-your-face, and more than just a little bit nutty. But I do like John the Baptist for what he truly was – a witness to Jesus, identifying Jesus as the true messiah, God’s very own specially chosen one whose coming had been foretold by the prophets. Throughout all of Christian history, John stands there, in all of his weirdness, pointing away from himself and to Jesus as The One on whom all history, all of the relationship between God and humanity, was going to pivot. And he calls us – demands of us – that we follow where his finger is pointing, and that we pay attention to Jesus as the one who breaks into the world and changes everything. It’s kind of interesting, the way that the gospels treat John the Baptist. He actually gets only a slight bit of print in the gospel of John, and when he does, it’s always in a way that clearly keeps him in a minor role with relation to Jesus. In the first three gospels, you get stories about his having many followers and disciples, and that he continues on with his own ministry even after Jesus has come on the scene. John is a lot more in the shadows in the fourth gospel; in fact, it’s here in this gospel that John the Baptist is quoted as saying that he must decrease, so that Jesus might increase. People have suggested that this difference in the way John is portrayed might have been because in the very early church, John the Baptist may have had a following of believers that were competing with Jesus’ followers, and that by the time the fourth gospel was written, it needed to be cleared up that John the Baptist was just a secondary player and Jesus was the real focus. I suspect there’s probably at least some truth to that explanation for the different way he’s treated in this gospel, but however he’s treated, John’s first and foremost job is to point to Jesus as the Christ – the one who illustrates, who personifies, the gospel – God’s good news for humanity. And that’s our first and foremost role as followers of Jesus, too. We’re called to point to him through all we say, and all we do – so that when people see us, and hear us, it’s clear that our focus is not all about us. So that they recognize we’re not just trying to be nice people; that there’s something more, something greater, that we’re pointing toward, that we’re witnessing to, testifying to, and that something is Christ. In that sense, we’re all called to be “Pointer Sisters,” and Brothers – always pointing to Christ and his message – the message of the gospel. But what do we mean when we say “the gospel”? We use that term a lot, but really, if some total stranger dropped out of the sky who’d never heard of Christianity, and they asked us, “just what exactly do you men when you talk about ‘the gospel’?” what would we say? What is the good news from God that Jesus was really proclaiming and showing us? Just what is it that we believe? What is God’s good news for humanity that we see through Jesus, and that we remember and honor during the Advent season as having broken into our world? That’s what we Pointer Sisters and Brothers point to this Advent season. That’s God’s real, true good news that we see opening up in the birth of Jesus. That’s the great, joyful news that we lift up when we light this week’s Advent candle, representing joy. And yet, despite these things, this is the season that we set aside to recognize and honor the coming of Christ into our world, as a sign of God’s wishes for reconciliation with all people. As the sign of God proclaiming peace and good will to all of us, entering into our existence, knowing firsthand our hopes, our aspirations, our greatest joys and our deepest grief. And through that, showing us how we’re to love God, and how an important way of loving God is how we love others. I believe that’s the most significant aspect of why God chose to reconcile with us by becoming one of us, in the flesh – to truly be God with us, God among us, through Christ – to show us how we’re supposed to be the key agents of illustrating, and spreading, God’s peace on earth, and God’s good will to all people. Today’s gospel reading is from Mark. It includes the title, the headline of the gospel: “The beginning of the good news of Jesus Christ, the Son of God.” Did you notice that this gospel isn’t titled, “The beginning of the story of Jesus Christ;” or even more significantly, it isn’t called “The whole story,” or “The beginning, middle, and end of the story?” What we read in Mark’s gospel is just the beginning of what God considers the good news, the tidings of great joy, of reconciliation, of true peace on earth and good will to all, that we receive in Jesus Christ. In other words, it’s an ongoing, unfinished story. This passage talks a bit about John the Baptizer. John is the preparation for the good news. In Jesus’ birth, we have the initiation of that news. In his life and teachings, we have the clarification of the good news. In his death and resurrection, we have God’s validation of the good news. And through the ongoing work of the Holy Spirit, joining us with Christ, we – we – are the continuation of the good news that God has proclaimed to the world through Jesus, beginning with the birth that we’re awaiting this season.